Now that the fire-weather has abated, we&apos;ll take a quick look back at some of things we&apos;ve been doing since we officially came into existence last year. We were conceived at the &apos;One Step Beyond&apos; conference held in Melbourne in September 2013, which was attended by SMEM volunteers. The conference was hosted by Incident Alert. We were officially registered on 18th October, 2013. New South Wales fires, October, 2013 - including Blue Mountains. 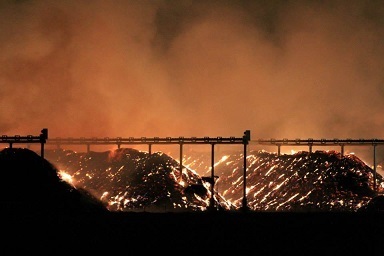 In addition, we provided a submission to the Hazelwood Mine Fire Inquiry. We are currently doing some analysis for the Inquiry on data we collected during the disaster. We were invited to join the VOST Leadership Coalition, coordinated by VOSG. We&apos;ve learned a lot by studying how other VOSTs operate throughout the world. By using a common worksheet format, we&apos;re able to scale up to engage trained SMEM volunteers from around the world to help in the event of catastrophe. Two of our members are on the organizing committee for the Twitter #SMEMau Special Event on 9th May. It has been very rewarding, collaborating with some of the most skilled SMEM operators, worldwide. We were mentioned in Victorian State Parliament by Neale Burgess MP on the 27th March, 2014. We&apos;ve had a founding member move on to other projects, and two new volunteers have joined VOST Victoria. We continue to reach out to SMEM operators where we find them. Our goals for the future are to create a Memorandum of Understanding with the Emergency Management Commissioner. We hope to gain support so that we can buy the tools that we need to use to work at our best. Animal Management has been one of the most popular activities we&apos;ve done, and so we&apos;re expanding our role in this area. We&apos;ll continue to provide service to the government by producing our job notes. Our volunteers will continue to inform the people of Victoria via social media. By managing this important resource, we&apos;re helping to make Victoria a more disaster resilient state. We&apos;d like to take this opportunity to thank some people who&apos;ve helped VOST Victoria grow. We&apos;re delighted to have enjoyed the support of Neale Burgess MP, who has gone out of his way to do everything possible to help us succeed. We&apos;d also like to thank George Hall for his hours of dedicated service. George has left on good terms, and will be sadly missed by all volunteers. We&apos;re always keen for feedback. Please send us an email, or catch up with us on Twitter or Facebook.